The aim of this paper is to distinguish between, and examine, three issues surrounding “Humphreys's paradox” and interpretation of conditional propensities. The first issue involves the controversy over the interpretation of inverse conditional propensities — conditional propensities in which the conditioned event occurs before the conditioning event. The second issue is the consistency of the dispositional nature of the propensity interpretation and the inversion theorems of the probability calculus, where an inversion theorem is any theorem of probability that makes explicit (or implicit) appeal to a conditional probability and its corresponding inverse conditional probability. 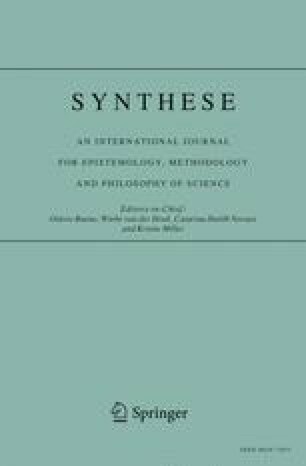 The third issue concerns the relationship between the notion of stochastic independence which is supported by the propensity interpretation, and various notions of causal independence. In examining each of these issues, it is argued that the dispositional character of the propensity interpretation provides a consistent and useful interpretation of the probability calculus. I would like to thank William L. Harper, Paul Humphreys, John Nicholas and Kathleen Okruhlik for helpful comments and advice on earlier drafts of this paper. Research for this paper was supported by a fellowship from the Social Sciences and Humanities Research Council of Canada (award number 452-90-2513).